Purchasing a gaming console is an expensive proposition today. You must spend a minimum of Rs 25000 to Rs 35000 for the console itself and each new game cost a whopping Rs 4000. Sure, the price of games falls over time but to build a nice library of games requires a significant investment. Microsoft is looking to change that. 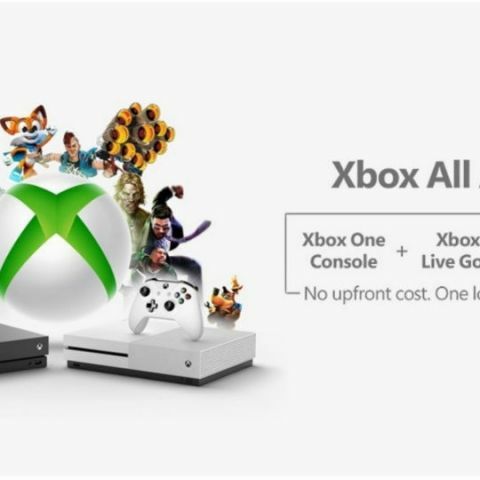 The company has announced Xbox All Access, a subscription service where the user gets an Xbox console along with subscription to Xbox Live Gold and Game Pass. Customers can get an Xbox One S with Xbox All Access at $21.99 per month (roughly Rs 1540 per month directly converted). The Xbox One X is available through Xbox All Access at $34.99 per month (roughly Rs 2500 per month directly converted). The total cost for a two-year subscription to Xbox All Access turns out to be about $528 (roughly Rs 37000 directly converted) for an Xbox One S and $840 (roughly Rs 59,000 directly converted) for an Xbox One X. At current prices, subscription to the services for 2 years and the cost of the console itself comes to about $660 (roughly Rs 46,300 directly converted) for the Xbox One S and $860 (Rs 60,000 directly converted) for the Xbox One X. This is considering customers purchased annual subscription for Xbox Live and Game Pass services. Even though the price difference isn’t significant, it is the cost the user must pay per month vs the one-time lump sum payment which makes the difference. It is always easier to pay a smaller amount per month than a large lump sum at one go. Microsoft Game Pass is a Netflix like subscription that gives you access to more than a hundred games for a monthly/annual fee. Just like Netflix, a few games are introduced to the service each month and a few games leave. All Xbox One exclusive games are a part of Game Pass from launch day. Microsoft has expanded options for gamers with services like Game Pass and Backwards compatibility making its console ideal for those looking to have a large catalogue of games at a lower cost. Sony on the other hand has subscriptions like PS Now, but it is about streaming PlayStation games and not giving users the ability to download and play them like Game Pass. Sony is also expected to launch its PS5 in 2019 to get a head start over Microsoft’s next console.